The second versus third Southern Combination League Division One encounter ended in a 2-2 draw after Bexhill had 2-0 at half time. Light said: “It was a game of really good quality between two teams that should be in a higher division. It was a real spectacle of an afternoon and had a big game feel to it. “It was a little bit disappointing at the end, but I didn’t want us to feel disappointed because it had been such a great effort and a great game. 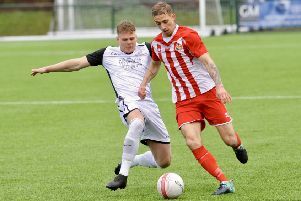 Bexhill remain four points behind Steyning and five ahead of fourth-placed AFC Varndeanians. Bexhill and Steyning each have two games left, and Varndeanians three. “We want to finish third and we need to make sure we finish third - and secure that highest finish for the club in many years,” continued Light. Bexhill are away to seventh-placed Hailsham Town on Easter Monday (kick-off 11am) and eighth-placed Mile Oak the following Saturday. “It’s always a tough place to go,” said Light, of the Hailsham clash. “They always roll their sleeves up and get stuck in. Andy Atkin is unavailable for Monday’s match, but fellow forward Drew Greenall is expected to return. Southern Combination League Division One top half standings (played-points): 1 Alfold 29-71 (+50 goal difference), 2 Steyning Town 30-71 (+48), 3 BEXHILL UNITED 30-67 (+62), 4 AFC Varndeanians 29-62 (+37), 5 Selsey 29-57 (+30), 6 Littlehampton Town 29-44 (+8), 7 Hailsham Town 30-40 (+6), 8 Mile Oak 29-37 (0), 9 Sidlesham 30-37 (-14).